Robert Schumann died on July 29, 1856 at the age of 46; even in his time this was an early death. And so, to apply the term "late works" to the compositions from the last years of his life, approximately from 1850 on, seems justifiable only in relation to his (short) life. But on the other hand, these "late" works might be different in a special way, they might contain a structure that we would be moved to call characteristic of Schumann's mature style. And, what role does Schumann's mental illness play? The compositions from Schumann's last years are certainly not (and in distinct contrast to his "early works") what we would today regard as box office successes. Granted, these ideas are not at all novel. They have been discussed by musicologists at least from the 1980s on. Lately many musicians have been strongly promoting Schumann's "late works", and it seems that now, at the end of 2010, it might not be too bold to state that for the larger part these Schumann compositions have been restored to good repute, if not yet well and far enough known. In our "Schumann Forum" as well numerous musicians were heard on this topic. Devoted readers of the Forum will remember (and the others are welcome to refer to back entries) that in this regard the opinions strongly differed. The scope reaches from Gerhard Oppitz' remark "ingenious, visionary, enigmatic" (9 Questions for Gerhard Oppitz) to Christian Zacharias: "I find Schumann's late works for the piano disturbing" (9 Questions for Christian Zacharias). The obvious circumstances of Schumann's wasting away and eventual death in the private hospital of Dr. Franz Richarz in Endenich make it difficult to take a factual and unbiased approach to the issue itself. Physicians widely agree that in his last years Schumann suffered from the progressive paralysis of a syphilitic disease acquired early (1831). This consensus holds strong, and is not in the least weakened by Uwe Peter's hypothesis, more or less a conjurer's hat trick; he willfully attempts to re-interpret the absolutely clear documents (journals, letters, diaries) and lastly reaches the "spectacular" conclusion that Schumann was not at all mentally ill, but simply an alcoholic who was removed to the insane asylum in Endenich by his wife Clara. Whatever the case may be, the fact remains that the oeuvre and illness in Schumann's case are to this day an unfortunate combination that necessarily lead to the general tendency of dismissing the issue; "what else would you expect from a madman?" 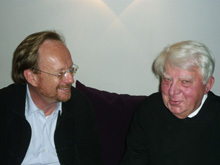 Solely for the Schumann Forum I broached the intriguing subject with Hans-Joachim Kreutzer. This inspiring conversationalist has the immense advantage that he is neither a musicological apologist of Schumann's "late works", nor is he a musician who feels the need to take sides as a performer. Mr. Kreutzer is a brilliant amateur pianist in the best sense of the word, and he was an internationally renowned professor at the University of Regensburg, as well as President of the Kleist Society. Kreutzer authored numerous articles on and about the intersection of literature and music. Above all, however, says the editor of the Schumann Forum, he is a highly sophisticated connoisseur of the works of Robert Schumann. I've made an excerpt of the audio interview with Mr. Kreutzer on Schumann's "late works" available here (in German language). It contains all of his core statements which you can read HERE also in English. Question: Mr. Kreutzer, do you use the term "late works" in regards to Schumann at all? And if yes, why? Question: To what extent do you share the widespread opinion that Schumann's works are influenced by his illness, and was that from the beginning the way the audience saw it? Question: You especially mentioned Schumann's "harmony" that noticeably changes in the "late works". Could you specify that? Question: Something new, something unexpected - is that characteristic of Schumann's "late works"? And please let us know what comes to your mind in regards to things new. Question: Which pieces impress you most in these regards? Question: Which of Schumann's late pieces do you most prefer to listen to or play ? Question: Are there any late compositions of Schumann that you would call "failed" ? Question: What is the reason that many musicians still tend to avoid playing Schumann's "late works"? Do they cater to the "large audiences" that prefer to hear the "Davidsbündlertänze" rather than "Gesänge der Frühe"? Dear Mr. Kreutzer, thank you very much for our rich and enlightening conversation. Dear Readers, to conclude this article I would like to offer you a link to a historic recording of Schumann's Violin Concerto. The sound of the recording is technically less than satisfying, but the performance moves (me) all the more, because Georg Kulenkampff woke Schumann's late works from their almost century long slumber; it is the premiere performance and recording. We can easily forgive him the fact that he takes such a liberal hand to the written music, because he expresses such true artistic greatness when he plays Schumann. On 15. December I will close the Schumann Forum with a farewell article on Schumann's very last composition. I much look forward to your visit.